Who would ever think that you could fit a webserver in a 3" by 3" by 3" cube? 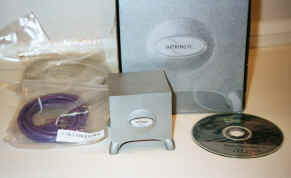 Will Intrinsyc though you could, and they did with the CerfCube. The CerfCube is a Windows CE (or Linux) based device for developers (or consumers) to help make Internet ready or enabled device. 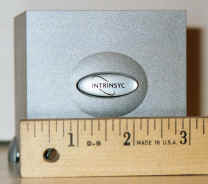 While checking the news one day I ran across Intrinsyc and their newest product, the CerfCube. I had never heard of this company before. Initially, I was reading about the first webserver that was a three inch cube. At first I was reading about a Linux/Apache based OS and then I read on and found out they offered a Windows CE version. You might have seen how you can turn your iPAQ into a webserver, but your iPAQ isn't really a good backbone for a server. The CerfCube is no iPAQ, it is a webserver and much more. The box for the CerfCube (as well as the CerfPod) where sitting on my porch when I arrived home. The box for the CerfCube fits well with the product, a cube shaped box. I ripped open the box to find this wonderful product incased in its own static bag. The shell of this device is not plastic, but very sturdy metal. It contains four exposed ports, power, Ethernet, USB, and a serial jack. The bottom is also uncovered with the main (and only) circuit board right there. On one side the board has the small Intel Strata memory chip as well as the port for a type II Compact Flash card. On the other side are various chips including the network chipset and the Intel StrongARM processor. Yes, erasing memory is a good thing. Every time you unplug, the device resets your memory. There are ways to take an image of your device, so you don't loose everything, but technically, you shouldn't be restarting a webserver a lot. This is a nice feature for users that aren't sure what they are doing at first and can easily rebuild the device by unplugging and re-plugging it. My home network is very simple. Basically I have two desktop computers connected via a switch with two laptops that I sometimes plug in as well. Initally I used my Laptop with Windows 2000 to connect to the CerfCub via Hyper Terminal, and then I used that computer or one of my desktops to access the deviceRMS and deviceWEB interfaces. If you have setup or worked with Apache or IIS this is nothing like that. It is much much simpler, in many respects, but also as more complex functions already built into it. For a C programmer, it is very easy to write server side scripts to use some of the features the server supports. The CerfCube does have applications in a normal families home. For instance, if a family wants to host a web page, but doesn't want to have to buy a computer just to host their site and they don't want it to run from one of their current computer, the CerfCube is a simple solution. With little setup, the CerfCube can be plugged into a router and setup to be the web host for the family. The CerfCube also has applications where it would not be effective choice to have a completely separate computer to host a website. 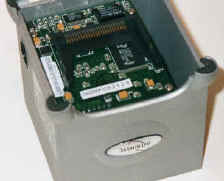 With a little programming and a flash memory card or microdrive, the CerfCube can become a simple fileserver for your network where you can hold files that are often accessed by multiple computers. The files can be viewed and modified through a simple web interface. In all honesty, the CerfCube is a great product. Simple, cheap, and works great. The product isn't just a geek toy and the product isn't just for IT professionals that need a solution. 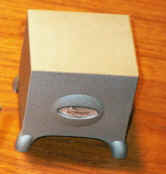 The CerfCube is a multipurpose tool that is very useful in many ways. Make sure to check out the CerfCube when you need any kind of small scale, simple to use, easy to setup web server, and advanced computer users, don't just think of this as a toy, cause a toy it is not. This means, this product is about as close to "the best" as you can get. This product embodies quality in its design and application, and is something I would use. Though you still should consider it for yourself, most would probably be happy with this product even if they were unable to try it.